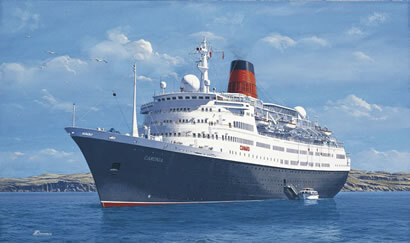 Cunard's most recent liner to bear the name, Caronia (III), was for many people one of the finest cruise ships afloat. Coupled with her popularity with passengers and crew as an extremely well-appointed vessel, Caronia was admired by ship-lovers everywhere as a truly classic liner with particularly attractive lines and well-balanced profile. Completed in 1973 as the Vistafjord by Swann Hunter Shipbuilders on Tyneside for Norwegian America Line, she was effectively the last major passenger vessel to be constructed in England. Inheriting much of her classic lines from Sagafjord, her older and slightly smaller sistership, Vistafjord's external appearance has remained largely unspoilt throughout her long career as cruise liner. When Vistafjord joined the Cunard fleet in 1983, she retained her name and much of her existing colour scheme, including the attractive dove-grey hull. Externally, only her new red and black funnel and modest Cunard housestyle lettering beneath her bridge wings proclaimed she was now a Cunarder. After Cunard Line came under Carnival ownership, plans ensued to give Vistafjord a new image and in December 1999 she first appeared at a renaming ceremony in Liverpool, resplendent with black hull and additional upper cabins, as the 'new' Caronia. 2003 saw another change of owner, name and livery, but it is in Caronia guise Gordon Bauwens has painted this fine portrait of the popular liner in his highly detailed style. First in a planned matching set to feature all three of Cunard's famous Caronia liners, admirers of this particularly handsome ship will be proud to add Caronia (III) to their collections of maritime art. Each print is Artist-signed and numbered, produced using fade-resistant inks on heavy acid-free art paper, and comes with matching Certificate of Authenticity. From a commissioned original gouache painting by Gordon Bauwens. Limited edition of 300 artist-signed and numbered fine art prints.